At present, many PV systems are installed. Based on the fact that self-generated electricity is generally cheaper and provides a high degree of electrical independence from the grid, PV systems will become an integral part of electrical installations in the future. However, these systems are exposed to all weather conditions and must withstand them over decades. The cables of PV systems frequently enter the building and extend over long distances until they reach the grid connection point. Lightning discharges cause field-based and conducted electrical interference. This effect increases in relation to increasing cable lengths or conductor loops. Surges do not only damage the PV modules, inverters and their monitoring electronics but also devices in the building installation. More importantly, production facilities of industrial buildings may also easily be damaged and production may come to a halt. If surges are injected into systems that are far from the power grid, which is also referred to as stand-alone PV systems, the operation of equipment powered by solar electricity (e.g. medical equipment, water supply) may be disrupted. The energy released by a lightning discharge is one of the most frequent causes of the fire. Therefore, personal and fire protection is of paramount importance in case of a direct lightning strike to the building. At the design stage of a PV system, it is evident whether a lightning protection system is installed on a building. Some countries’ building regulations require that public buildings (e.g. 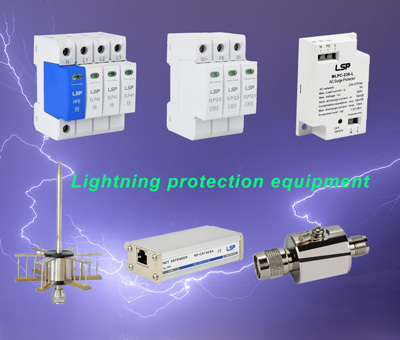 places of public assembly, schools, and hospitals) be equipped with a lightning protection system. In case of industrial or private buildings, it depends on their location, type of construction and utilization whether a lightning protection system must be installed. To this end, it must be determined whether lightning strikes are to be expected or could have severe consequences. Structures in need of protection must be provided with permanently effective lightning protection systems. According to the state of scientific and technical knowledge, the installation of PV modules does not increase the risk of a lightning strike. Therefore, the request for lightning protection measures cannot be derived directly from the mere existence of a PV system. However, substantial lightning interference may be injected into the building through these systems. Therefore, it is necessary to determine the risk resulting from a lightning strike as per IEC 62305-2 (EN 62305-2) and to take the results from this risk analysis into account when installing the PV system. Section 4.5 (Risk Management) of Supplement 5 of the German DIN EN 62305-3 standard describes that a lightning protection system designed for the class of LPS III (LPL III) meets the usual requirements for PV systems. In addition, adequate lightning protection measures are listed in the German VdS 2010 guideline (Risk-oriented lightning and surge protection) published by the German Insurance Association. This guideline also requires that LPL III and thus a lightning protection system according to the class of LPS III be installed for rooftop PV systems (> 10 kWp) and that surge protection measures be taken. As a general rule, rooftop photovoltaic systems must not interfere with the existing lightning protection measures. In case of a lightning discharge, surges are induced on electrical conductors. Surge protective devices (SPDs) which must be installed upstream of the devices to be protected on the a.c., d.c. and data side have proven very effective in protecting electrical systems from these destructive voltage peaks. Section 9.1 of the CENELEC CLC/TS 50539-12 standard (Selection and application principles – SPDs connected to photovoltaic installations) calls for the installation of surge protective devices unless a risk analysis demonstrates that SPDs are not required. According to the IEC 60364-4-44 (HD 60364-4-44) standard, surge protective devices must also be installed for buildings without external lightning protection system such as commercial and industrial buildings, e.g. agricultural facilities. Supplement 5 of the German DIN EN 62305-3 standard provides a detailed description of the types of SPDs and their place of installation. Cables must be routed in such a way that large conductor loops are avoided. This must be observed when combining the d.c. circuits to form a string and when interconnecting several strings. Moreover, data or sensor lines must not be routed over several strings and form large conductor loops with the string lines. This must also be observed when connecting the inverter to the grid connection. For this reason, the power (d.c. and a.c.) and data lines (e.g. radiation sensor, yield monitoring) must be routed together with the equipotential bonding conductors along their entire route. PV modules are typically fixed on metal mounting systems. The live PV components on the d.c. side feature double or reinforced insulation (comparable to the previous protective insulation) as required in the IEC 60364-4-41 standard. The combination of numerous technologies on the module and inverter side (e.g. with or without galvanic isolation) results in different earthing requirements. Moreover, the insulation monitoring system integrated into the inverters is only permanently effective if the mounting system is connected to earth. Information on the practical implementation is provided in Supplement 5 of the German DIN EN 62305-3 standard. The metal substructure is functionally earthed if the PV system is located in the protected volume of the air-termination systems and the separation distance is maintained. Section 7 of Supplement 5 requires copper conductors with a cross-section of at least 6 mm2 or equivalent for functional earthing (Figure 1). The mounting rails also have to be permanently interconnected by means of conductors of this cross-section. If the mounting system is directly connected to the external lightning protection system due to the fact that the separation distance s cannot be maintained, these conductors become part of the lightning equipotential bonding system. Consequently, these elements must be capable of carrying lightning currents. The minimum requirement for a lightning protection system designed for a class of LPS III is a copper conductor with a cross-section of 16 mm2 or equivalent. Also, in this case, the mounting rails must be permanently interconnected by means of conductors of this cross-section (Figure 2). The functional earthing / lightning equipotential bonding conductor should be routed in parallel and as close as possible to the d.c. and a.c. cables / lines. UNI earthing clamps (Figure 3) can be fixed on all common mounting systems. They connect, for example, copper conductors with a cross-section of 6 or 16 mm2 and bare ground wires with a diameter from 8 to 10 mm to the mounting system in such a way that they can carry lightning currents. The integrated stainless steel (V4A) contact plate ensures corrosion protection for the aluminum mounting systems. Separation distance s as per IEC 62305-3 (EN 62305-3) A certain separation distance s must be maintained between a lightning protection system and a PV system. It defines the distance required to avoid uncontrolled flashover to adjacent metal parts resulting from a lightning strike to the external lightning protection system. In the worst case, such an uncontrolled flashover can set a building on fire. In this case, damage to the PV system becomes irrelevant. The distance between the solar generator and the external lightning protection system is absolutely essential to prevent excessive shading. Diffuse shadows cast by, for example, overhead lines, do not significantly affect the PV system and the yield. However, in the case of core shadows, a dark clearly outlined shadow is cast on the surface behind an object, changing the current flowing through the PV modules. For this reason, solar cells and the associated bypass diodes must not be influenced by core shadows. This can be achieved by maintaining a sufficient distance. For example, if an air-termination rod with a diameter of 10 mm shades a module, the core shadow is steadily reduced as the distance from the module increases. After 1.08 m only a diffuse shadow is cast on the module (Figure 4). Annex A of Supplement 5 of the German DIN EN 62305-3 standard provides more detailed information on the calculation of core shadows. The U/I characteristics of photovoltaic current sources are very different from that of conventional d.c. sources: They have a non-linear characteristic (Figure 5) and cause long-term persistence of ignited arcs. This unique nature of PV current sources does not only require larger PV switches and PV fuses, but also a disconnector for the surge protective device which is adapted to this unique nature and capable of coping with PV currents. Supplement 5 of the German DIN EN 62305-3 standard (subsection 5.6.1, Table 1) describes the selection of adequate SPDs. To facilitate the selection of type 1 SPDs, Tables 1 and 2 show the required lightning impulse current carrying capability Iimp depending on the class of LPS, a number of down conductors of the external lightning protection systems as well as the SPD type (voltage-limiting varistor-based arrester or voltage-switching spark-gap-based arrester). SPDs which comply with the applicable EN 50539-11 standard must be used. Subsection 9.2.2.7 of CENELEC CLC/TS 50539-12 also refers to this standard. Multipole type 1 + type 2 combined d.c. arrester FLP7-PV. This d.c. switching device consists of a combined disconnection and short-circuiting device with Thermo Dynamic Control and a fuse in the bypass path. This circuit safely disconnects the arrester from the generator voltage in case of an overload and reliably extinguishes d.c. arcs. Thus, it allows protecting PV generators up to 1000 A without an additional backup fuse. This arrester combines a lightning current arrester and a surge arrester in a single device, thus ensuring effective protection of terminal equipment. With its discharge capacity Itotal of 12.5 kA (10/350 μs), it can be flexibly used for the highest classes of LPS. FLP7-PV is available for voltages UCPV of 600 V, 1000 V, and 1500 V and has a width of only 3 modules. Therefore, FLP7-PV is the ideal type 1 combined arrester for use in photovoltaic power supply systems. Voltage-switching spark-gap-based type 1 SPDs, for example, FLP12,5-PV, is another powerful technology that allows discharging partial lightning currents in case of d.c. PV systems. Thanks to its spark gap technology and a d.c. extinction circuit which allows to efficiently protect downstream electronic systems, this arrester series has an extremely high lightning current discharge capacity Itotal of 50 kA (10/350 μs) which is unique on the market. Reliable operation of SPDs in d.c. PV circuits are also indispensable when using type 2 surge protective devices. To this end, the SLP40-PV series surge arresters also feature a fault-resistant Y protective circuit and are also connected to PV generators up to 1000 A without an additional backup fuse. The numerous technologies combined in these arresters prevent damage to the surge protective device due to insulation faults in the PV circuit, the risk of fire of an overloaded arrester and puts the arrester in a safe electrical state without disrupting the operation of the PV system. Thanks to the protective circuit, the voltage-limiting characteristic of varistors can be fully used even in the d.c. circuits of PV systems. In addition, the permanently active surge protective device minimizes numerous small voltage peaks. The operating voltage on the d.c. the side of PV systems differs from system to system. At present, values up to 1500 V d.c. are possible. Consequently, the dielectric strength of terminal equipment also differs. To ensure that the PV system is reliably protected, the voltage protection level Up to the SPD must be lower than the dielectric strength of the PV system it is supposed to protect. The CENELEC CLC/TS 50539-12 standard requires that Up is at least 20 % lower than the dielectric strength of the PV system. Type 1 or type 2 SPDs must be energy-coordinated with the input of terminal equipment. If SPDs are already integrated into terminal equipment, coordination between the type 2 SPD and the input circuit of terminal equipment is ensured by the manufacturer. Every d.c. input (MPP) of the inverter must be protected by a type 2 surge protective device, for example, SLP40-PV series, that reliably protects the d.c. the side of PV systems. The CENELEC CLC/TS 50539-12 standard requires that an additional type 2 d.c. arrester be installed on the module side if the distance between the inverter input and the PV generator exceeds 10 m.
The a.c. outputs of the inverters are sufficiently protected if the distance between the PV inverters and the place of installation of the type 2 arrester at the grid connection point (low-voltage infeed) is less than 10 m. In case of greater cable lengths, an additional type 2 surge protective device, for example, SLP40-275 series, must be installed upstream of the a.c. the input of the inverter as per CENELEC CLC/TS 50539-12. Moreover, a type 2 SLP40-275 series surge protective device must be installed upstream of the meter of the low-voltage infeed. CI (Circuit Interruption) stands for a coordinated fuse integrated into the protective path of the arrester, allowing the arrester to be used in the a.c. a circuit without an additional backup fuse. SLP40-275 series is available for every low-voltage system configuration (TN-C, TN-S, TT). If inverters are connected to data and sensor lines to monitor the yield, suitable surge protective devices are required. FLD2 series, which features terminals for two pairs, for example for incoming and outgoing data lines, can be used for data systems based on RS 485. Figure 13 shows the surge protection concept for a PV system with external lightning protection system and sufficient separation distance s between the PV system and the external lightning protection system. The primary protection goal is to avoid damage to persons and property (building fire) resulting from a lightning strike. In this context, it is important that the PV system does not interfere with the external lightning protection system. Moreover, the PV system itself must be protected from direct lightning strikes. This means that the PV system must be installed in the protected volume of the external lightning protection system. This protected volume is formed by air-termination systems (e.g. air-termination rods) which prevent direct lightning strikes to the PV modules and cables. The protective angle method (Figure 14) or rolling sphere method (Figure 15) as described in subsection 5.2.2 of the IEC 62305-3 (EN 62305-3) standard may be used to determine this protected volume. A certain separation distance s must be maintained between all conductive parts of the PV system and the lightning protection system. In this context, core shadows must be prevented by, for example, maintaining a sufficient distance between the air-termination rods and the PV module. Lightning equipotential bonding is an integral part of a lightning protection system. It must be implemented for all conductive systems and lines entering the building which may carry lightning currents. This is achieved by directly connecting all metal systems and indirectly connecting all energized systems via type 1 lightning current arresters to the earth-termination system. Lightning equipotential bonding should be implemented as close as possible to the entry point into the building to prevent partial lightning currents from entering the building. The grid connection point must be protected by a multipole spark-gap-based type 1 SPD, for example, a type 1 FLP25GR combined arrester. This arrester combines a lightning current arrester and a surge arrester in a single device. If the cable lengths between the arrester and the inverter are less than 10 m, sufficient protection is provided. In case of greater cable lengths, additional type 2 surge protective devices must be installed upstream of the a.c. the input of the inverters as per CENELEC CLC/TS 50539-12. Every d.c. the input of the inverter must be protected by a type 2 PV arrester, for example, SLP40-PV series (Figure 16). This also applies to transformerless devices. If the inverters are connected to data lines, for example, to monitor the yield, surge protective devices must be installed to protect data transmission. For this purpose, FLPD2 series can be provided for lines with the analog signal and data bus systems such as RS485. It detects the operating voltage of the useful signal and adjusts the voltage protection level to this operating voltage. Another possibility to maintain the separation distances is to use high-voltage-resistant, insulated HVI Conductors which allow to maintain a separation distance s up to 0.9 m in air. HVI Conductors may directly contact the PV system downstream of the sealing end range. More detailed information on the application and installation of HVI Conductors is provided in this Lightning Protection Guide or in the relevant installation instructions. If the roofing is made of metal or is formed by the PV system itself, the separation distance s cannot be maintained. The metal components of the PV mounting system must be connected to the external lightning protection system in such a way that they can carry lightning currents (copper conductor with a cross-section of at least 16 mm2 or equivalent). This means that lightning equipotential bonding must also be implemented for the PV lines entering the building from the outside (Figure 17). According to Supplement 5 of the German DIN EN 62305-3 standard and the CENELEC CLC/TS 50539-12 standard, d.c. lines must be protected by a type 1 SPD for PV systems. For this purpose, a type 1 and type 2 FLP7-PV combined arrester is used. Lightning equipotential bonding must also be implemented in the low-voltage infeed. If the PV inverter(s) is (are) situated more than 10 m from the type 1 SPD installed at the grid connection point, an additional type 1 SPD must be installed on the a.c. side of the inverter(s) (e.g. type 1 + type 2 FLP25GR combined arrester). Suitable surge protective devices must also be installed to protect the relevant data lines for yield monitoring. FLD2 series surge protective devices are used to protect data systems, for example, based on RS 485. – Buildings without external lightning protection system = type 2 SLP40-275 arresters for alternating / three-phase current in close proximity to the microinverters and SLP40-275 at the low-voltage infeed. – Buildings with external lightning protection system and sufficient separation distance s = type 2 arresters, for example, SLP40-275, in close proximity to the microinverters and lightning current carrying type 1 arresters at the low-voltage infeed, for example, FLP25GR. – Buildings with external lightning protection system and insufficient separation distance s = type 1 arresters, for example, SLP40-275, in close proximity to the microinverters and lightning current carrying type 1 FLP25GR arresters at the low-voltage infeed. Independent of particular manufacturers, microinverters feature data monitoring systems. If data is modulated to the a.c. lines via the microinverters, a surge protective device must be provided on the separate receiving units (data export/data processing). The same applies to interface connections with downstream bus systems and their voltage supply (e.g. Ethernet, ISDN). Solar power generation systems are an integral part of today’s electrical systems. They should be equipped with adequate lightning current and surge arresters, thus ensuring long-term faultless operation of these sources of electricity.